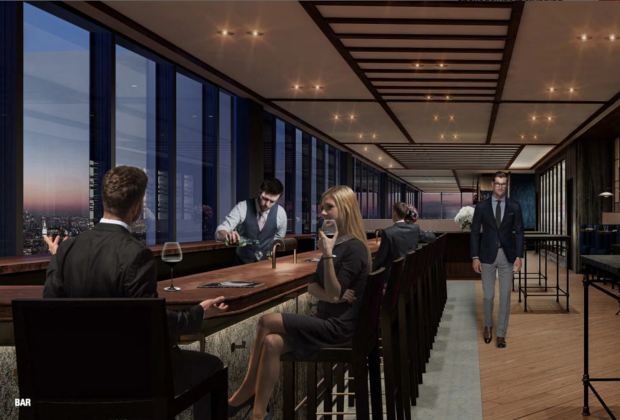 A rendering of the new, still unnamed Danny Meyers restaurant that will offer expansive views from the 60th floor of 28 Liberty. FINANCIAL DISTRICT — A Lower Manhattan office tower will soon be topped with a $30 million restaurant, bar and event space. Restaurateur Danny Meyer and his company Union Square Hospitality Group, whose other eateries include Gramercy Tavern, Battery Park City's North End Grill and Shake Shack, is slated to open an expansive restaurant on the 60th floor of 28 Liberty, as first reported by the New York Post. The 38,000 square-foot space, offering 360 views of Lower Manhattan, will include a restaurant and bar, along with an area for special events with room for up to 800 people. According to the Post, the event space will be the highest ballroom in the city. Meyer told Eater that even though the views will be "extraordinary," the restaurant will not be "fancy" — bucking what he said is a trend for restaurants perched up high to have more of a luxury feel and price point. He said he plans to make the yet-unnamed restaurant approachable and one that people would want to visit regularly, not just for special occasions. “It’s going to be giving a real gift to New York City,” Meyer told Eater of opening the top floor of the building to the public. The eatery plans to open within the year, the Post reported.